Welcome to the Vallejo Chamber of Commerce! 2018 Large Business of the Year, Medic Ambulance, has a rich history of providing quality advanced life support ambulance services in the North San Francisco Bay area. They are the exclusive 911 ambulance provider for all of Solano County with the exception of Vacaville. Medic offers an array of services ranging from EMT/BLS level of care, to Paramedic/ALS care, as well as emergency or non-emergency transportation. Medic has been proudly offering these services as company staples for over 30 years. On March 6, 2019, the Vallejo Chamber of Commerce hosted the 2019 State of the City of Vallejo! In partnership with the City of Vallejo, this event highlighted partnerships, public safety, and economic development efforts of the past year that are helping the city toward fiscal sustainability. Sponsored by Medic Ambulance, this sold out event was a huge success! Get to learn the ins and outs of starting your own small business with free resources offered by SCORE and the Solano SBDC. 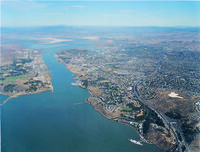 There are so many advantages to living and working in Vallejo! Weather, location, diversity and opportunity are but a few.